The league’s deputy commissioner said the decision belongs to the team. 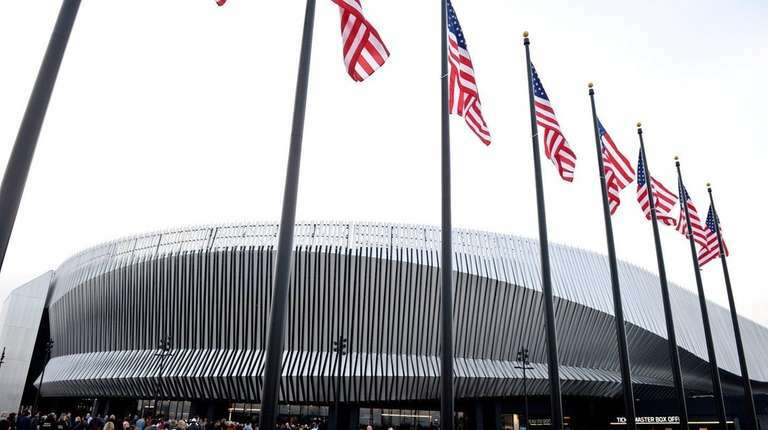 NHL deputy commissioner Bill Daly said the league is open to the Islanders playing games at Nassau Coliseum while the team’s arena at Belmont Park is being built. “I wouldn’t rule it out as a possibility,” Daly told Newsday in an email Tuesday. Commissioner Gary Bettman previously said the Coliseum wasn’t a viable option for the Islanders, even on a short-term basis. But last month he indicated a willingness to revisit that after some playful pressuring from Gov. Andrew M. Cuomo at the Islanders’ Belmont Park news conference. The Islanders played their home games at the Coliseum from the franchise’s birth in 1972 until 2015, when they moved to Barclays Center in Brooklyn. The Coliseum, now named NYCB Live’s Nassau Veterans Memorial Coliseum, reopened last March after an 18-month, $165-million renovation. It is operated by Brooklyn Sports & Entertainment, the same company that runs Barclays Center. The Islanders did not immediately respond to a message seeking comment. Islanders co-owner Jon Ledecky sidestepped questions about the team’s interim arena plans at the Belmont news conference last month. A day later on WFAN radio, Ledecky said the decision about a short-term return to the Coliseum would be up to Bettman. But Daly said Tuesday that the decision “ultimately” belongs to the Islanders. Ledecky has said the Islanders plan to play the 2018-19 season at Barclays Center, as per their arena lease. Where they play in the year — or years — after that season while they await their new arena at Belmont remains the biggest unanswered question. Momentum, though, is building toward a return to the Coliseum. Mandy Gutmann, a spokeswoman for Brooklyn Sports & Entertainment, said last month that they already have presented the Islanders with a “proposal” to make the Coliseum their interim home, adding that the company is “prepared to facilitate any necessary enhancements” to the arena. And hours after the Islanders’ celebratory Belmont Park news conference, Cuomo’s office released a statement pledging its support to help facilitate a short-term return to the Coliseum.